The Loretta Young Show (originally known as Letter to Loretta) is an American anthology drama television series broadcast on Sunday nights from September 2, 1953, to June 4, 1961, on NBC for a total of 165 episodes. The series was hosted by actress Loretta Young, who also played the lead in various episodes. The Loretta Young Show was sponsored by Procter & Gamble for its first seven seasons, from 1953 to 1960. For its eighth and final season, from 1960 to 1961, the series was sponsored by Warner-Lambert's Listerine. The program began with the premise that each drama was an answer to a question asked in her fan mail; the program's original title was Letter to Loretta. The title was changed to The Loretta Young Show during the first season (as of February 14, 1954), and the "letter" concept was dropped altogether at the end of the second season. At this time, Young's health, which had deteriorated due to a heavy production schedule during the second season, required that there be a number of guest hosts and guest stars; her first appearance in the 1955–56 season was for the Christmas show. From this point on, Young appeared in only about half of each season's shows as an actress and merely functioned as the program hostess for the remainder. She became known for swirling around in her gowns during her entrance through a door at the start of the show, a convention parodied by many comedians, including Ernie Kovacs. After the audience had seen me well-groomed, I can wear horrible clothes, ugly make-up, or even a false nose during the show without anyone wondering whether I've aged overnight or something. 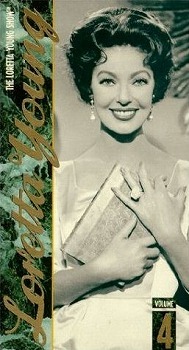 This program, minus Young's introductions and summarized conclusions (Young insisted on their deletion due to her concern that the dresses she wore in those segments would "date" the program), was rerun in daytime by NBC as The Loretta Young Theatre from October 1960 to December 1964, and then appeared, again without the introductions and conclusions, in syndication through the 1970s. In 1992, selected episodes of the original series (with Young's opening and closing segments intact), authorized by Young herself and chosen from her personal collection of 16mm film prints, were released on home video, and eventually shown on cable television. During the series' eight-year run, the series was popular with audiences and critics, and it finished in 28th place in the Nielsen ratings in the spring of 1955. It finished its last season far behind its competition, Candid Camera on CBS, and was thereby canceled. In 1954, Billboard voted it the third best network filmed drama series. In 1959, the series won a Golden Globe Award for Best TV Show. Loretta Young earned three Best Actress Primetime Emmy Awards in 1955, 1957 and 1959. Norbert Brodine claimed an Emmy for Best Cinematography in 1957. Young also earned Emmy nominations in 1954, 1956, 1958, 1960 and 1961, while Brodine was nominated in 1955, 1956 and 1958 as well. Other Emmy nominations were for Best New Program in 1954, Best Dramatic Series – Less Than One Hour in 1959, Best Direction for Robert Florey in 1955, Best Teleplay Writing – Half Hour or Less for Richard Morris in 1957 and Best Art Direction in a Television Film for Frank Paul Sylos in 1959. The Directors Guild of America nominated Robert Florey in 1955 and Norman Foster in 1957 for their work on the series. ^ "Loretta Young, 1913-2000". People.com. Retrieved 26 August 2018. ^ "ClassicTVHits.com: TV Ratings > 1950's". Classictvhits.com. Retrieved 26 August 2018. ^ "Billboard". Nielsen Business Media, Inc. 31 July 1954. Retrieved 26 August 2018 – via Google Books.